Boulder City High School boys volleyball team finished this week’s play with a 1-2 record. 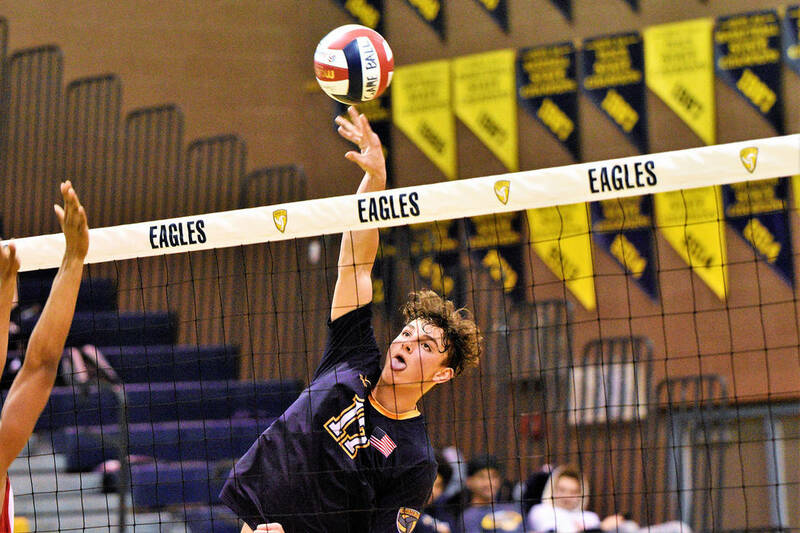 (Robert Vendettoli/Boulder City Review) Spiking a thunderous kill, Boulder City High School junior Preston Jorgensen generates a point for the Eagles against Del Sol on Monday, March 25, 2019. The Eagles defeated 4A Eldorado 3-0 on March 20, before falling to 3A Mojave 3-2 on March 21 and concluding the week with a 3-0 loss to Del Sol on Monday, March 25, falling 21-25, 24-26-19-25 to the Dragons. Their record for the season stands at 4-8. Defeating Eldorado 25-8, 25-15, 25-13, junior Preston Jorgensen tallied nine kills and senior Karson Bailey added eight kills. Junior Boen Huxford generated 20 assists and freshman Kannon Rose had 12 digs defensively. Playing tough against Mojave, the Eagles fell 19-25, 25-21, 25-22, 16-25, 12-15. Boen Huxford dished put 35 assists, while Jorgensen generated them into 33 kills. Rose had 26 digs defensively. Against Del Sol, Bailey generated 13 kills, Jorgensen had 10 kills and Boen Huxford dished out 15 assists. The Eagles will host Chaparral on Friday, March 29, before traveling to Valley on Tuesday, April 2, and hosting Western on Wednesday. Winning its second meet in a row, Boulder City High School girls track team won a weekday event at Sunrise Mountain on March 19. Finishing with a team score of 64, the Lady Eagles edged past Chaparral (54) and Sunrise Mountain (45) behind strong performances from sophomore Chloe Payne and freshman Mary Henderson, who each won a pair of events. Payne placed first in the 100-meter hurdles (18.8) and triple jump (30-6), while placing third in the 300-meter hurdles (57.7). In distance running, Henderson placed first in the 800-meter run (2:50.3) and 1600-meter run (6:12.5). Forming one of the top distance teams in the 3A classification, sophomore Sophie Dickerman placed first in the 3200-meter run (14:54.2), and second in the 1600-meter run (6:12.5), while junior Sarah Oberweis placed second in 3200-meter run (15:48.1), and third in the 1600-meter run (6:49.1). Sophomore Christina Dunagan finished first in the pole vault (7-0). Senior Erin Cowley placed third in the discus (86-6) and shot put (26-0.75). For the boys, sophomore Sonny Peck led the Eagles to a third-place finish with a team score of 51.5, placing first in the 110-meter hurdles (17.8), pole vault (9-0) and triple jump (36-11.5), along with a fourth-place finish in the long jump (16-7). Chaparral (75) won the meet, while host Sunrise Mountain (53.5) finished second. In throwing competition, sophomore Rafe Echeverria placed first in the discus (89-1) and shot put (32-10), senior Noah Calvert placed second in the 3200-meter run (13:15.1) and sophomore Sean White finished second in the 1600-meter run (5:06.3) in distance running. Sophomore Julian Balmer finished second in the triple jump (36-8). Junior Cole Barber and sophomore Spencer Torgesen each placed second in the pole vault (7-0). Traveling to rival Moapa Valley today, March 28, the Eagles will compete against the Pirates and Del Sol. Rolling through league play, Boulder City High School boys golf team steamrolled the competition at Las Vegas National on Monday, March 25. Finishing with a team score of 345, senior Kevin Phelps picked up his first victory of the season with a score of 84 on the par-71 course. Claiming the top four spots, sophomore Blake Schaper (86), freshman Jace Waldron (87) and sophomore Kyle Carducci (88) finished second, third and fourth, respectively. Somerset Academy Sky Pointe finished second with a score 413, followed by Virgin Valley (419) and Chaparral (526). Playing 4A Green Valley at Legacy Golf Club on Tuesday, March 26, Schaper and Carducci both shot a 38 on the par-36 nine-hole course. Continuing their season on Tuesday, April 3, the Eagles have a 3A Sunrise League match at The Palms. Swimming at Heritage Park on Saturday, March 23, both Boulder City High School swim programs were dominant in their meet against Valley. Senior Rose Pouch (50-yard freestyle and 100-yard butterfly) and junior Quinci Thomas (100-yard breaststroke and 500-yard freestyle) each won a pair of events, part of the sweep in all eight individual events, for the Lady Eagles, which defeated Valley 196-55. Sophomores Daphne Thompson (100-yard backstroke), Kathleen Gray (200-yard freestyle) and Isabella Fecteau (200-yard individual medley) and freshman Ainsley Rogers (100-yard freestyle) won their respective events. Routing the Vikings, the boys won 175-56 behind a pair of first-place finishes from senior Chandler Larson in the 100-yard freestyle and 100-yard backstroke. Senior A.J. Pouch placed first in the 100-yard butterfly, freshman Martin Thompson placed first in the 200-yard individual medley, sophomore Elias Woodbury placed first in the 50-yard freestyle, and sophomore Ethan Porter placed first in the 500-yard freestyle. Remaining at Heritage Park for another week, the Eagles will host 4A Palo Verde on Saturday, March 30, in what should be their biggest test of the season.